Whether you’re an avid runner, a casual walker, or just someone who likes to do yard work, chances are you’ve found yourself dealing with your fair share of aches and pains. 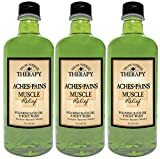 Well, before you reach for over-the-counter (or even prescription) medications, I want to tell you about the essential oil approach to muscle pain relief. In the medical community, generic muscle pain is called myalgia. Muscle pain that’s caused by inflammation is known as myelitis. There can be a number of triggers that can cause both types of muscle pain, as well as some additional symptoms that can accompany it. Muscle pain often results when we ask our body to do something it isn’t capable of doing. We pull, push, or lift something that’s too heavy for us, which causes the strands of fibrous tissue that make up our muscles to stretch or tear. We can also damage our muscles by using them repetitively to make the same movement over a period of time. Think tennis elbow. Muscle pain can also result when we fail to properly warm up our muscles and ask them to do too much too soon. Muscle pain can also be caused by stress or tension, as we contract many of our muscles at once, causing discomfort. It can also result from an accident or injury. If your muscle pain persists, or if it is accompanied by other symptoms, you might want to consult a physician to rule out any other problems. Muscle pain caused by injury, overuse, and other common causes is typically localized to one area of the body. Systemic muscle pain, or pain that is felt throughout your body, is more than likely the result of an illness, infection, or side effect of a medication. For example, influenza (flu), can cause generalized aches and pains that can be confused with muscle pain. You can experience muscle pain in practically any part of your body. Common sources of pain include the back, neck, arms, legs, and even your hands. It can occur in a single muscle or group of muscles. Rarely, it can also affect your entire body. Muscle pain can range from mild to excruciating. While most aches go away by themselves after a few days, muscle pain can sometimes linger for months. Pain that does not resolve within a short amount of time might warrant a trip to your doctor’s office. Because the symptoms of muscle pain can be mild and often resolve on their own, many people do very little (or even nothing at all) to treat them. Most remedies only numb or dull the pain, without addressing the underlying cause. While ice, rest, and stretching are all excellent options for relieving sore, achy muscles, I have found incredible benefits by combining the use of essential oils alongside these other standard treatment options. They can be used in a variety of applications, such as in bath soaks, creams, massage oils, or even in a diffuser. Some essential oils act as analgesics and actually relieve pain. Others help to reduce inflammation or improve blood flow. Even those that don’t directly treat the muscles themselves can help to encourage calm and rest, easing the tension that often leads to muscle pain, and improving your overall mood and stress level. It can be massaged directly into the affected area, added to a hot bath, or even used in a cold compress. Like other members of the mint family, it has a calm, soothing effect on muscles that are tight. It’s also great for treating muscle pain that results from injuries, as it has anti-microbial properties that can prevent microorganisms from infecting wounds. It’s important to note, however, that it should never be placed directly onto the skin or taken orally without first being diluted. This oil smells so sweet that even merely inhaling it brings relief to many sore muscle sufferers. (2) Its soothing aroma helps relieve the stress that can cause muscle aches. It is mild enough to be applied topically, so I like to put a few drops on my neck or forehead when I have a tension headache. While the aroma itself provides much relief, lavender oil also possesses analgesic and anti-inflammatory properties. Lavender oil can be mixed with coconut oil or castor oil and massaged directly onto sore muscles. It’s also an excellent sleep aid to help you rest and recover. I add a few drops to a diffuser in my bedroom at night. It can also be added to bath water. Another pleasant-smelling option, rosemary oil is a well-known herbal healer with anti-inflammatory properties. Also, it’s antiseptic and anti-bacterial to help wounds stay clean while they heal. Because rosemary also helps improve circulation, it actually helps to speed up the healing of damaged nerve tissues. Rosemary oil does not have to be diluted in a carrier oil, as it’s mild enough to be used directly on the skin. (3) When applied topically I’ve found it to be very effective at relieving pain and swelling. In addition to this, rosemary oil has also been proven to aid in healing skin, reducing cellulite, and even improving hair growth. As it turns out, this aromatic oil can do a lot more than just provide flavor for gin. Its health benefits are numerous and include anti-rheumatic properties that can help ease stiffness and soreness and aid in blood circulation, which promotes healing. It’s an excellent stress reducer. Adding 10-15 drops to a hot bath is a great way to unwind. It can also be added to a carrier oil such as olive oil or jojoba, but only in small amounts (two to four drops). (4) Pregnant women, those with kidney problems, and children under age three should avoid it entirely. In addition to its pain-relieving properties, juniper also acts as an astringent to tighten blood vessels and help stop bleeding. It’s an antiseptic as well, so it helps keep wounds germ-free. Commonly used by those who have fibromyalgia, helichrysum essential oil boasts anti-inflammatory, anti-oxidant, and anti-spasmodic properties. (5) It also helps to improve circulation, which aids in healing. Inhaling helichrysum essential oil is known to have calming effects. It can be used in a diffuser or added to a bath. It can also be diluted with coconut oil and applied directly to the skin. It has the ability to relieve sunburn instantly and can also relieve not only the pain of a bruise but also its discoloration of the skin in a very short amount of time. Well known for helping to fight congestion from the common cold, eucalyptus essential oil harnesses that same soothing, expanding property that opens up your chest and sinuses to help ease the tension in sore muscles. Inhaling eucalyptus oil has pain-relieving benefits, so it’s excellent for diffusing. When applied topically it has much of the same anti-inflammatory and analgesic properties as juniper. (6) It can be used as a cream or lotion or in a bath oil or salt. However, like many other oils on this list, it should only be used in very small amounts. My favorite thing about this product, which contains eucalyptus, menthol, and spearmint, is the cooling sensation. It provides significant relief when used directly as a body wash or added to a bath. I even found that the benefits increased the longer I soaked. The scent is great. It isn’t too overwhelming. I like the added benefit of having it open up my sinuses while it soothes my muscle pain. I also appreciate that it doesn’t leave me feeling oily or greasy, and it isn’t hard to rinse out of the tub. The thing that most impressed me about this product was how fast it started working. It has a nice warming sensation, and I felt relief pretty much instantly. The scent was pretty potent, but it faded quickly and was way more bearable than a lot of the other creams out there. The price seemed a little steep to me at first, but a little bit of this cream really does go a long way. Plus, the company offers a money back guarantee, so you don’t have anything to lose. I would recommend this to anyone who suffers from chronic pain. I highly recommend this product for anyone who’s new to using essential oil for muscle pain relief. It’s a great way to test the waters and see the benefits without having to invest in a lot of full-size oils and mix them yourself. It also sells for a pretty compelling price. I mixed this with coconut oil at a 1:3 ratio, and the bottle lasted me probably two months. It smells great and has a cooling effect. I could feel the results for about three hours before I felt the need to reapply. Did you enjoy learning about the various essential oils that can help you treat your muscle pain? If so, please feel free to share this article on social media. I’d also love to get your feedback in the comment section. Essential oils have made such a difference in the way I address muscle pain. Before I discovered these remedies, I would eat ibuprofen like candy the day after a strenuous workout. This is such a better way.